If you have a free day and feel like doing some exploring outside of our hub, I recommend taking a trip to West Palm Beach. The downtown area is artsy, funky, and has lots of options for us foodies. Luckily, our own Fort Lauderdale has the Brightline train station which can get you to West Palm in under an hour (close to 45 minutes), and from what I hear, comfortably. I have been meaning to check out the new addition to our city. I will update you guys as soon as I do because I’m REALLY looking forward to try out this train and go back to West Palm. So, let’s get to the food. 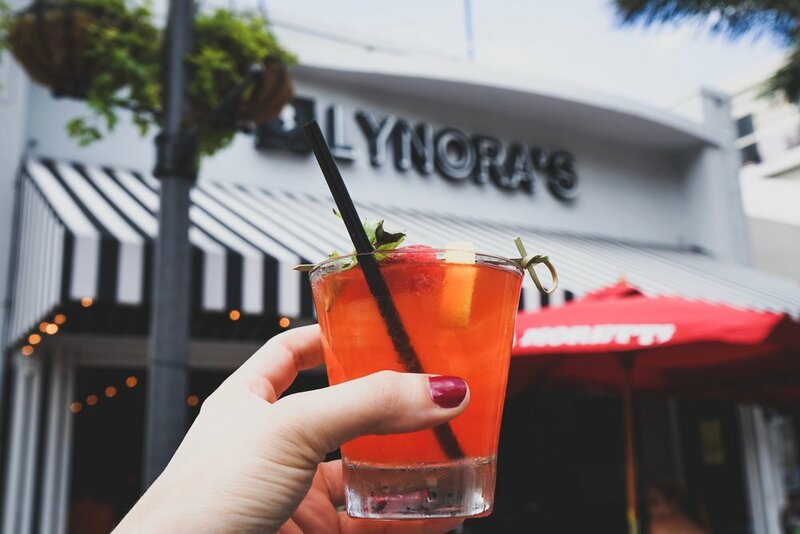 We went to Lynora’s West Palm Beach; a vibrant Italian restaurant with a fresh, daily made in house menu and a really solid happy hour menu. The restaurant was started by an Italian couple, Rafaella and Maria, in 1974 when they came to South Florida from Italy. You might get lucky like I did and come in at a time when Maria is in the kitchen cooking her traditional plates for the guests. We ordered a burrata to start. I mentioned earlier this restaurant was fresh. The burrata, a semi-soft Italian cheese, much like fresh mozzarella but with a creamier inside, is delivered fresh daily, so get it while you can because its popular! The cheese was exquisite and served over a bed of arugula (perfect) and cherry tomatoes. Lynora’s serves bread to its guests, and this is dish is a perfect compliment. I’m really here to rave about this next dish. The Pasticcio Bolognese is a crepe lasagna baked in a wood burning oven with the most delicious Bolognese sauce I’ve ever had and a creamy, rich béchamel sauce that ties the whole plate together. This dish was plate licking good and puts so many other lasagnas to shame. The béchamel sauce, which in my opinion is what sends great lasagnas through the roof, and the Bolognese sauce are made daily in house, from Maria’s mother’s recipes. The tradition of this taste has been passed down and you can taste it on the first bite. The wood burning oven is the perfect touch for a little crisp around the edges. The second dish is the Grouper Lynora, another classic and popular dish at this location. Tender and soft grouper with mushrooms, artichoke, shrimp and scallops over risotto. Excellent! Had to go with a Tiramisu Classico – vibrant expresso flavors with creamy richness and soft cake. AND, it had chocolate and white chocolate chips! Which, to my surprise, was the perfect addition for texture.